Turkish Prime Minister criticized over recordings of conversations between him and his son, in which they discuss how to hide money. Turkish Prime Minister Recep Tayyip Erdogan came under fire on Tuesday over recordings of a series of conversations allegedly between him and his son, Bilal, were made public. The two men in the recordings discuss in detail how to hide vast amounts of money, reported CNN, and were allegedly made the day after a wide-reaching corruption investigation ensnared the sons of three cabinet members. Bilal was questioned but never detained in the investigation, the report noted. 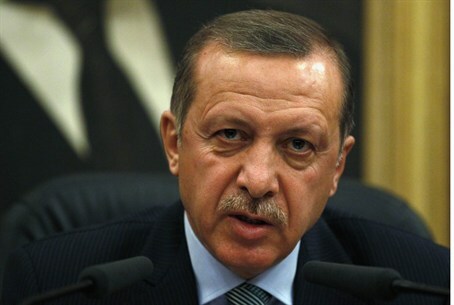 Erdogan denied the recordings were authentic and denounced them. "This is not an attack on Recep Tayyip Erdogan, the leader of the AK Party, but an attack on the Turkish Republic," he said in a weekly speech to parliament members from his ruling Justice and Development Party. Erdogan labeled the audio recordings "immoral edited material," according to CNN. "They are listening to the government's encrypted phones; that's how low they have sunk," he continued, denouncing a series of lobby groups that he has long accused of plotting to overthrow his government. Erdogan has pledged to investigate corruption within his government. But the Prime Minister has also denounced implications that his family is involved in the scandal. On Tuesday, protesters took to the streets in the wake of the scandal. Police in Istanbul used tear gas and water cannon to try to push protesters back. In the phone conversations, the two men discuss in detail how to hide money and whom to give it to. At one point, one warns the other man to be cautious about talking on the phone. Kemal Kilicdaroglu, leader of the opposition Republican People's Party, or CHP, played the recordings at a speech before an assembly of CHP lawmakers. "Either you take a helicopter and flee abroad or you resign," Kilicdaroglu said. Most mainstream Turkish television channels interrupted their live broadcast of Kilicdaroglu's speech when he began playing audio of the alleged conversation between Erdogan and his son. They then resumed the broadcast after the audio recordings stopped playing. CNN noted that embarrassing recordings of private phone conversations have been emerging on the Internet on an almost weekly basis in Turkey, ever since police detained the cabinet ministers' sons and dozens of other businessmen and officials closely linked to Erdogan's government on December 17. The government denounced the investigations, saying they were part of a coup attempt by what Erdogan officials described as a "parallel state" established within the police force and the judiciary. Thousands of police officers were removed from their posts after the corruption investigation that caught Erdogan's administration by surprise. In late December, three senior Turkish ministers resigned as the government continued to reel from the fallout of the corruption scandal. Erdogan subsequently replaced half the ministers in his cabinet. In addition, Erdogan has faced protests over a new law that would tighten controls over web use. Last week, riots broke out in Istanbul's Taksim Square over the new censorship laws, which allow the local the Telecommunications Communications Presidency (TIB) to demand that Internet providers block pages deemed insulting or considered an invasion of privacy. Despite the protests on the street, Turkey's president Abdullah Gul signed the law into force last week.